Oh man. I thought I was ready to go back tomorrow. I still believe, and know, all the things I wrote. I am a teacher, no matter what. But, OH! how my heart hurts not to be going back to the kids who had become mine, and not teaching the thing I know best. To some extent, this happens every year. I mourn the loss of students I know I won’t have again, either because they won’t be in my classes, or because they graduate. I celebrate their successes and I wonder how I can ever do better for my next group of students. I wonder if I’m good enough for the kids coming in. I wonder if we’ll be as awesome together as the last classes were. And every year, we surpass my wildest dreams. Every year, together, we do something that I would have never dreamed possible. 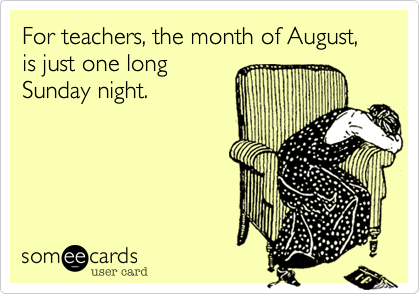 I know this feeling I have of loss is really part of the “one big Sunday” that August is for teachers. I know the truth, in my head, at least: we’ll do it again. They will be awesome, and I’ll grow with them. Together we’ll do something great.